As we get closer and closer to the MACNA 2011, we wanted to start looking back at last year’s event. Held in Orlando, the event featured some of the most prominent speakers in the industry. 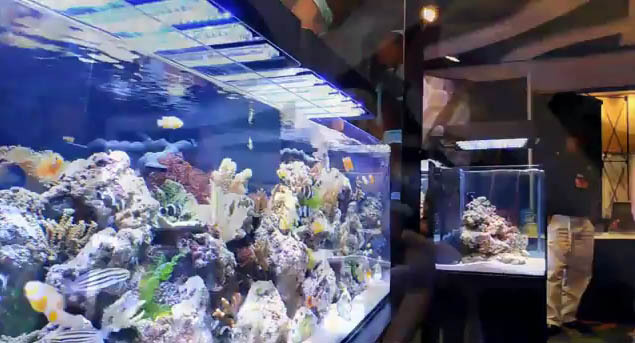 They covered topics such as holistic Reef Keeping, rotifers, coral propagation, green reef keeping, reef tank photography, redundancy, and much more. The 3 day event was a huge success, and we can’t wait for this year’s September 9-11th event, to be held in De Moines, IA. Wed’ like to begin by checking out Ecoxotic‘s products, as they were displayed throughout MACNA 2010. This video showcases the 100W LED Cannon, 50W LED Cannon, PAR 38 LED bulbs, Panorama LED Fixtures and Stunner Strips. Along with their own display Ecoxotic was a focal point of the Oceans Reefs and Aquariums (ORA) display.